Channel 2 News reports one of Olmert's lawyers was caught smuggling classified documents out of his cell. Investigation underway. 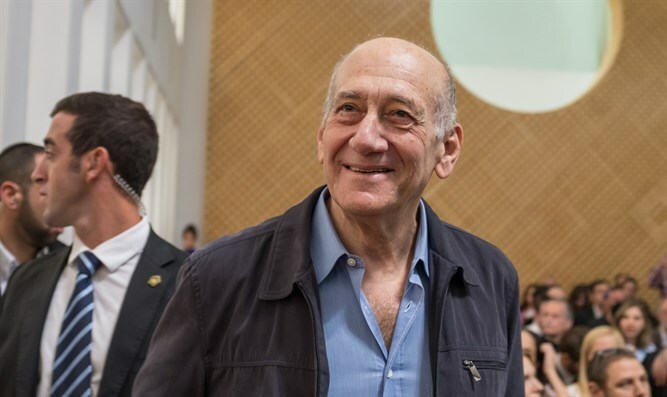 One of the lawyers representing former Prime Minister Ehud Olmert was caught with classified documents in his possession as he left the prison in which Olmert is serving time, Channel 2 News reported Friday. The Justice Ministry said the material has not been transferred to it and therefore it cannot comment on the matter. Olmert previously requested special permission to write his book on a computer, but was refused. As such, he is writing the book by hand and so far has written over 1,000 pages, according to Channel 2 News. The material he is writing is subject to the review of the military censor. The lawyer who was caught on Thursday, according to the report, is a very senior lawyer in Israel. The Israel Prison Service would not comment on the matter, but it could have implications for Olmert's possible early release, noted Channel 2 News. The parole board is to meet in two weeks to discuss Olmert's request to shorten his sentence.